At approx. 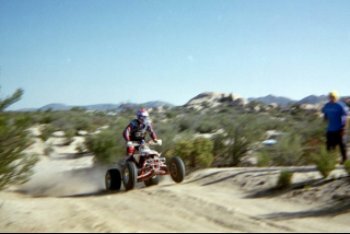 race mile 80, my son Chris and I found a great spot to watch this year's Baja 500. 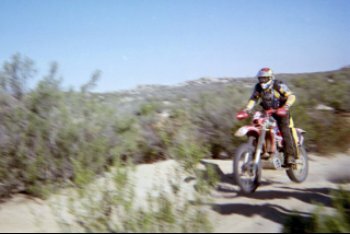 The first '500' race began in 1968 as an Ensenada to Ensenada loop through northern Baja California. 35 years later the concept remains the same, but many of the vehicles have sure changed! First to start are the motorcycles... several classes are based on engine size or rider's age. They began to arrive at our location before 8 am. 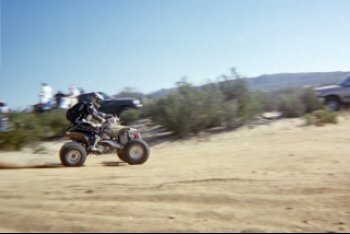 Next came the quads! There is a class for most any vehicle! over all kinds of terrain and up to 5,000' above sea level. 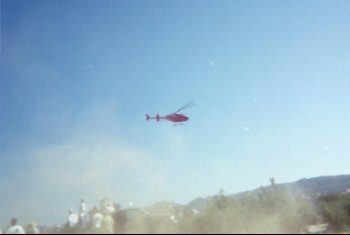 When we started seeing helicopters, we knew the big bad Trophy Trucks were coming!